For twenty years students have worked with me on collaborative projects within Laxyuup Gitxaała. Some have conducted research as part of ethnographic field schools (2006, 2007), others have worked as research interns with Gitxaała Nation, and others still have been research assistants working directly with me as research assistants and/or collaborators. Providing student research opportunities is an expectation placed on faculty at research universities like UBC. Under the collaborative research relationship with Gitxaała all research data collected is considered to belong to Gitxaała Nation, but the Forests and Oceans for the Future Research Group has been granted a revocable license to publish results of our ongoing research. Publications are reviewed by appropriate members of community leadership and/or community agencies (like Gitxaała Environmental Monitoring). Some of the students have produced final reports for internal community distribution, others have gone on to produce theses and some have published peer reviewed articles. This post is a summary of theses and peer-reviewed publications that have emerged from the past two decades of collaborative research and highlights the work done by students. Readers will note that most of the student researchers’ published peer reviewed articles are sole authored pieces by the students themselves (the exceptions reflect long term professional collaborations). While acknowledging that the data belongs to Gitxaała Nation, it is important to ensure that the intellectual work of preparing reports, theses, and publishable articles of student authors is clearly recognized. Where the working relationship developed into one of professional colleagues in which we both come equally to the writing table then there is a trajectory of co-authorship. For most of the students their involvement ended with the submission of a report to Gitxaała Nation. Their reports included any interviews or related data for use by Gitxaała as community leadership saw fit. The data attached to those reports remained the intellectual property of Gitxaała Nation. My own publications do not make use of or (usually) reference to the student reports. My objective has been to encourage the student authors to prepare their own materials for publication, as long as it has been reviewed by Gitxaała prior to publication. One other technical point of note: UBC ethics requirements. Under the terms of UBC’s Behavioural Research Ethics Board (which follows the Tri-Council Policy on Research Ethics) research data must be held at UBC in a secure location for at least five years after the close of a research project. In addition, UBC considers the faculty member supervising student research (either in courses or for graduate study) to be the principal investigator (PI). Sometimes students misunderstand this point. Being the PI of record doesn’t mean that the faculty member ‘owns’ the student’s work, it merely lays out legal obligations and responsibilities of the faculty member. Thus, as a faculty member supervising student work I am legally responsible for the research practices of students under my supervision and have therefore a legal obligation to ensure, to the best of my ability, that proper ethical practices are followed. This also means that I am obligated to store research data in a UBC facility for at least five years. After five years I destroy what data may have been left with me. Original copies of research data are held permanently by Gitxaała Nation in their research archives. Sometimes students also hold copies of research data, but for field school students Gitxaała expected them to return all materials to Gitxaała Nation at the close of their course when they handed in their final projects. Developing out of two ethnographic field schools (2006, 2007) and a host of research internships have come a strong collection of MA Theses, listed here in reverse chronological order. Danielle Gendron. 2016. Eating Gitxaała, being Gitxaała: food and cultural security. [research internship]. Research Reports that Became Peer Reviewed Publications. Each student in the two ethnographic field schools submitted a written report on their fieldwork to Gtixaała Nation (or, to their community partner if they weren’t working with Gitxaała). Some of these students turned their reports into peer reviewed publications. 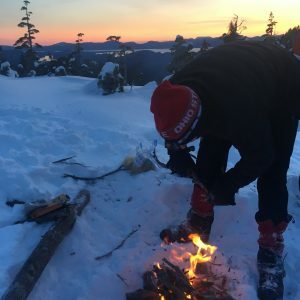 Five students published reflections on fieldwork in a special section of the journal Collaborative Anthropologies: “Collaborative Service Learning and Anthropology with Gitxaała Nation.” 2011. 4:169-242. Several other students have published peer reviewed chapters or articles independently of the above project. Marina Lasalle. 2013. “‘Capital-C’ Consultation: Community, Capitalism and Colonialism.” New Proposals. Vol. 6(1-2). Oralia Gómez-Ramírez. 2016. “Coping with Colonialism: Services for Aboriginal Women in Prince Rupert, British Columbia.” New Proposals. Vol. 8(1). Robin Anderson. 2016. “Gitxaała’s Own Food: Decolonizing Food Practices.” New Proposals. Vol. 8(1). Danielle Gendron. 2016.”Eating Gitxaała, Being Gitxaała: Food and Cultural Security.” New Proposals. Vol. 8(1). Over the period of field research a number of research reports have been produced by students, associates, and contractors working within the Forests and Oceans for the Future reserach group. Though these reports do not arise from specific fieldschool or internship projects they are relevant to the general corpus of materials produced through the collaborative project. Cora den Hartigh. 2015. Saltwater Ethnobotany. 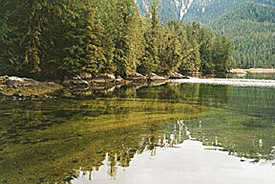 Between 1997 and 2002 the provincial agency, Forest Renewal BC, funded a series of community-based reserach projects. A range of different types of publications were produced which included curriculum materials for the K-12 school system and a special section of the Canadian Journal of Native Education. In addition, Caroline Butler, PhD, ( formerly a UBC graduate student) and I produced a series of papers that started with the FRBC project but have continued since as our own collaborative relationship shifted from student/ research supervisor to colleagues and co-researchers. These papers are all based upon research conducted by Butler and Menzies in collaboration with Gitxaała community researchers. 2000. Caroline Butler and Menzies. “Out of the Woods: Tsimshian Women and Forestry Work. Anthropology of Work Review. 21(2):12-17. 2001 Menzies and Caroline Butler. “Working in the Woods: Tsimshian Resource Workers and the Forest Industry of BC.” American Indian Quarterly. 25(3):409-430. 2006. Menzies and Caroline Butler. “Introduction: Understanding Ecological Knowledge.” In Charles R. Menzies (ed). Traditional Level Ecological Knowledge and Natural Resource Management. 1-17. Lincoln, Nebraska: Nebraska University Press. 2007 Caroline Butler and Menzies. “Traditional Ecological Knowledge and Indigenous Tourism.” In R. W. Butler and T. Hinch (Eds). Tourism and Indigenous Peoples. Pp. 18-31. London: Elsevier. 2007. Menzies and Caroline Butler. “Returning to Selective Fishing Through Indigenous Fisheries Knowledge: The Example of K’moda, Gitxaała Territory.” American Indian Quarterly 31(3):441-464. 2008. Menzies and Caroline Butler. “The Indigenous Foundation of the Resource Economy of BC’s North Coast.” Labour/Le Travail 61:131-149. 2011. Menzies and Caroline F. Butler. “Collaborative Service Learning and Anthropology with Gitxaała Nation.” Collaborative Anthropologies 4:169-242. Caroline Butler, Linda Matson, and Menzies. 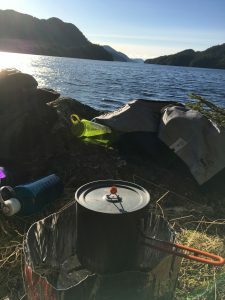 “Newcomer Self-Provisioning on the North Coast of British Columbia. New Proposals.” Vol. 8(1). In Press. Menzies and Caroline Butler. “Redefining University Research Enterprises: partnership and collaboration in Laxyuup Gitxaała.” In Irene Bellier and Jennifer Hayes (eds). Scales of governance and Indigenous Peoples’ rights in a globalized world: New rights or same old wrongs? London: Routledge. For the past three years I have been engaged in a coastal alpine project based in K’tai (on Pitt Island) within Laxyuup Gitxaała. Up until now these trips have all taken place between May and September. Much of what has motivate these trips has been a question about the possible – what might it take to move through and live within these places in ways that approximate the lives of our ancestors. This past week we extended our seasonal experience in the K’tai mountains and spent three days walking into the core area of our ongoing field research. I’ve been blessed with great crew members on each of these forays into the K’tai. 2015: Jarek Ignas-Menzies, Cora den Hartigh, Knut Kitching, Alfred Larsen, Monica Nederend. 2016: Bryn Letham, Peter Merchant, Naomi Smethurst, Arron Trowbridge. 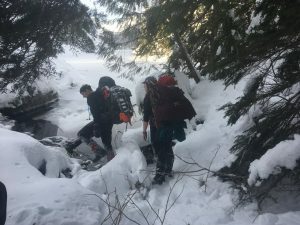 I wasn’t certain that we would be able to even get part of the way in given the nature of our access route which is kind of like an ungroomed Grouse Grind with two lake crossings. This field research is focussed on an area of Pitt Island accessed from the head of an inlet and takes us up to about 650m elevation. From there we have been establishing a base camp from which we conduct field studies between 650m and 1100m elevation – essentially the alpine ridges and peaks. To get there when there is no snow on the lower and mid elevations is tough but not impossible. My question was whether we would be able to do it with snow and sub-zero temperatures. Flying into the trailhead I could see that some lower elevation lakes were frozen while others had clear water. But, it was not until we had made the 1.5km hike up to the first lake we knew the lake was frozen, but not enough to walk over. There was lots of open water along the creek mouth shoreline where we would have previously put our rafts in to paddle the 1.5 km length of the lake to the next trail head. Our next problem was figuring out if we could actually walk around the lake. The northern shore of the lake was shorter in distance to our next trail head, but about a third of the way is a cliff face that cuts from the step slopes straight into the lake. We were pretty sure that wasn’t passible. The longer southern shore was also covered in fall downs, rock slides, and dense devil’s club thickets. Rather than lug our backpacks around only to find ourselves confronted by an impassible obstacle we decided to test the navigability of the shoreside. After tracking along for about a third of the way we decided that it was possible to get around. It was getting close to sundown so but rather than walk around the lake that afternoon we decided to pitch camp at the lakehead and work our way around it the following day. The next morning we started picking our way around the lake, scrambling up and down the steep shoreline, at times on our hands and knees, over fallen trees, through thickets, and occasionally along animal trails that gave momentary hope that we had left the worst of it all behind. The walk around the lake was about 2.3km. It took us an hour and a half to do. By now the sun was up. It was becoming a warm and beautiful sunny day. We took a break to have lunch in the sun, dry out some clothes, rest a bit, and just enjoy the viewpoint. 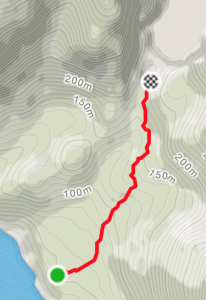 The hardest hike was still ahead of us -2.5 to 3km with a 500m elevation gain. The hike up to the second lake took us two and three quarters hours. According to my GPS we clocked 3.2km. 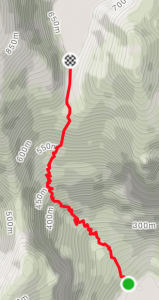 Between measurement error on the GPS, variations in specific path taken, I’ve found that this trail can measure out anywhere between 2.5 and 3.5 km. There was only a dusting of snow at the start of this trail. By the time we reached about the 350m elevation mark we had a couple of inches and by around 400m no denying that we were walking in snow. The top section from around 500m elevation had accumulations of between 30cm and 1m of snow making the hike up just that much more ‘interesting.’ The last couple of hundred meters of this trail follows a buried creek in a sharp little ravine. When clear of snow we simply jump from rock to rock walking along an essentially level, but moss covered rocky trench. The snow cover made this section more difficult than I had previously experienced it. 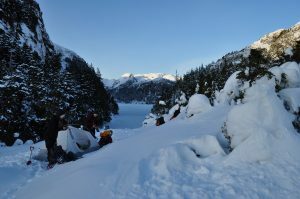 We were happy to see solid ice across the second lake when we came out of the trail – but before making our way to the lake we had a steep slope (almost vertical) of about 10 meters elevation that we had to scramble up through the loosely consolidated snow. Once standing in front of the lake shore we dropped packs and I went down to the lake to check the thickness. Using a small axe I cut in to find that the ice was more than 8 inches deep. Okay, we were free to head over the lake to the other end where a hunter’s cabin is located – though we weren’t sure what state it might be in with all the snow at that level. Our crossing of the lake was interrupted by coming into a patch of slush over the lake about 6 inches deep or so. 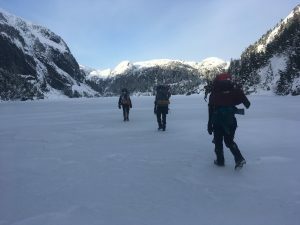 Given the time of day (4pm) and the uncertainty of the state of the cabin, plus the worrisome condition of the ice, we turned around to go back to where the trail had come out at the lake. We set up camp deciding to wait until the next morning to check the conditions of the lake and, weather permitting, head across the lake. Far better to do this at the start of the day than to race against a setting sun in sub-zero temperatures. 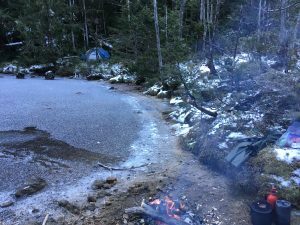 The camp site at the western end of the lake is an amazing place – summer and winter. Two years previously Bryn Letham, Naomi Smethurst, and I spent several nights camped there when we had no way to paddle over the lake. On that previous trip we had climbed the adjoining ridges (to north and then south) to work our way round this lake and the third one a bit further to the east. As part of our camp we had built a small lean-to for rain shelter. After setting up our tents we got a fire going and started preparing supper. We made use of the poles from the old lean-to to cut up for firewood and soon had a cheery blaze going. For my part I was so cold that I had to escape to my tent for the night. My crew very kindly brought my supper to the tent! The overnight temperature dropped to around -10C. About 4 to 6 inches of snow fell over night. It was a beautiful sight to wake up to, but the accumulated snowfall combined with a northerly wind and continued light snow made me reconsider going any further. If I knew that I could rely upon the cabin on the far side of the lake I knew that we would be able to dry out any of the wet gear we had (or mostly I had!) accumulated. This was important. But, if the cabin was damaged from the snow (it’s a decades old cabin) or buried by snow accumulation that would make the cabin unusable. Rather than taking the risk to check out the cabin I decided that it would be best for us to head back down toward sea level where there was less snow and at the very least better shelter opportunities. We broke camp, suited up, and headed back down the hill retracing our steps. The entire trek down took about four and a half hours – not too bad. By the time we were down the sun had come out and a strong nor-westerly breeze was blowing into the inlet. I had hoped we might be able to work our way to a nearby cabin (about a kilometre away, but the tide was up making walking out of the question and the wind was too strong to effectively use our packrafts. So we got ready to spend the night at the trailhead. While we were doing that I sent a message via our satellite communicator to Ocean Pacific Air, our charter service, to ask if they could pick us up that afternoon of the next morning. Within minutes they had responded saying they would be there within the hour. Good thing too, as the following day turned out to be a big storm which would have left us on sight for a day or two more. The experience trying this route in February gives a nice insight to the knowledge and equipment that our ancestors would have needed in order to navigate through these places. It humbles one to consider how, what for us today is often a rare expedition, was to them just part of a normal day.